There are several amazing total solar eclipse pictures that have come to light during the past few days, but not many can compare to the above image, taken by Geoff Sims with the assistance of Glenn Schneider. Taken at 35,000 feet over the north Atlantic, the image shows the total solar eclipse and the supernatural looking shadow racing across the clouds. A video of the event can be found here. It’s rather scary seeing the shadows creep across the clouds, engulfing the light. A unique experience for all lucky enough to witness it. Onwards! 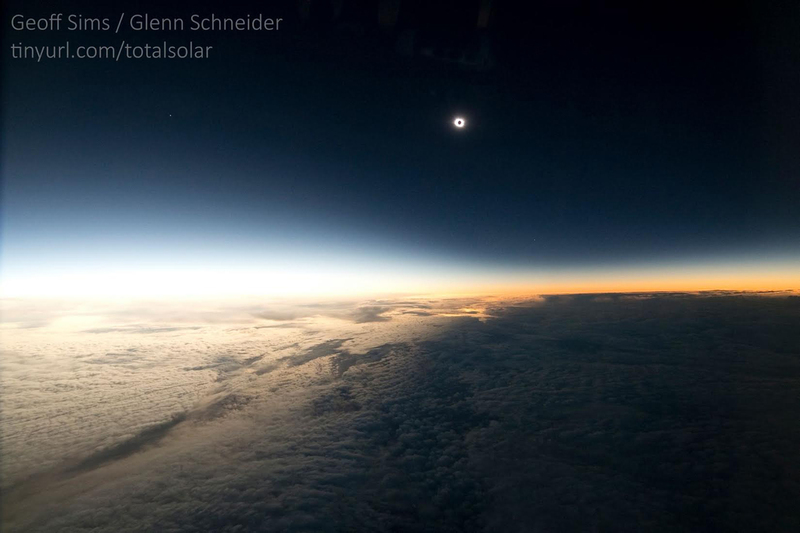 This entry was posted in Photography, Science and tagged 35000 feet, Bad Astronomy, clouds, Geoff Sims, Glenn Schneider, Phil Plait, shadow, Slate, solar eclipse, total solar eclipse. Bookmark the permalink.